The sales director of a West Midlands roofing firm tried to disclaim his managerial status to stop the Health and Safety Executive (HSE) charging him with neglect after an untrained apprentice sustained severe head, facial and back injuries when he fell more than 6 m through a fragile skylight on to a concrete floor. He was eventually convicted under s 37 (1) of the Health and Safety at Work Act and received a community order. The 18-year-old apprentice at Adam Askey was unfamiliar with the type of roof being repaired and had not received any training for work near skylights. 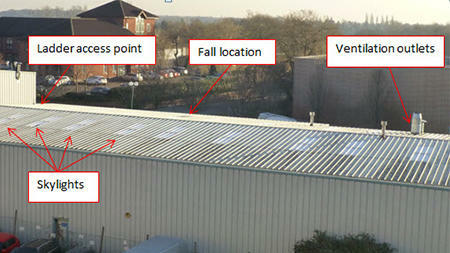 A HSE investigation found that the apprentice was carrying out roof surveying work at a factory on the Fletchworth Gate Industrial Estate in Coventry on 29 November 2016 when the accident happened. The sales director and another roofer were present on the roof at the time. The trainee was placed in an induced coma for three weeks and has been unable to work since his discharge from hospital in January 2017. HSE inspector Luke Messenger told IOSH Magazine that Steven Dickson was charged under s 37 (1) of the Health and Safety at Work Act because the offence committed by Adam Askey could be attributable to his neglect. “During the investigation, he described himself as a self-employed sales consultant but it later became clear that he had been given full senior management status from day one of his appointment and was receiving a regular weekly fee at the same level as Adam Askey’s other senior directors,” said Messenger. When the case was heard at Coventry Magistrates’ Court on 13 December, it was accepted that Dickson was a senior director of the company. He had been formally appointed to the board of directors in May 2017, six months after the accident. The HSE investigation found that Dickson had met the clients, prepared the quote and risk assessment and was leading workers on the day of the accident. He had personally surveyed the roof, taking photographs and preparing the survey report. This meant that he was fully aware of the roof’s height and dimensions and the presence and condition of the large number of fragile skylights. Dickson also failed to identify the need for fall protection measures in his survey report and marked the question asking if scaffolding was required with a “N/A”. On 5 November 2016, he had met Clayton VS managers and informed them that scaffolding was not needed and gave assurances that precautions would be taken at the roof edges in the form of a rail or barrier. On the day before the accident, Dickson had signed a risk assessment, which was not specific to the risks on-site, did not identify risks from fragile skylights and did not specify the control measures used to prevent falls. Because Dickson had not informed Clayton VS that he was on site with the roofers, the client had no opportunity to check that appropriate precautions had been taken. Dickson pleaded guilty to the s 37 breach and Adam Askey pleaded guilty to breaching reg 4(1) of the Work at Height Regulations and was fined £120,000. Dickson was given a 12-month community order that required him to do 200 hours’ unpaid work and to submit to an electronically-monitored curfew between 8pm and 6am for a period of four weeks starting on 13 December 2017. Both were also ordered to pay full prosecution costs. The table shows how the Sentencing Council guidelines were applied to Adam Askey. Summing up, district judge Rebecca Crane said the risks must have been obvious to Dickson. Even if the court accepted his lack of training in risk assessment, he had taken on a role he was not qualified for, which had raised the company’s culpability. She also agreed that a prohibition notice issued against Adam Askey for unsafe work at height in 2011 was an aggravating feature and that there was an element of profit before safety.